Leading specialist powered access supplier Wilson Access, part of the AFI group of companies, attended the APF Exhibition in September creating significant interest in their tracked access platforms for the forestry and agricultural sectors. The APF Exhibition took place at Ragley Estate, Alcester in September and attracted 320 exhibitors and 22,000 visitors over the three-day event. It was a hugely successful event for Wilson Access, who were on-hand to provide advice to visitors and demonstrated the versatility of the track mounts. The Wilson Access team demonstrated how the hydraulically adjustable tracks and variable jacking options make them ideal for working on gradients and how, because they are light in weight, they allow for minimum ground pressure, making them perfect for enabling works on various rough terrains from parks and patios to forests and woodland. 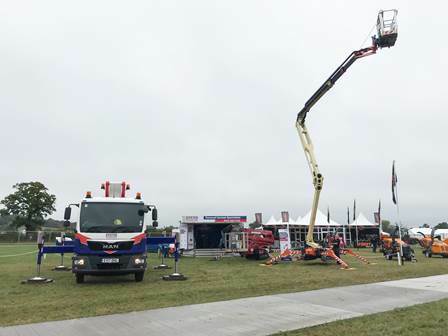 The demonstrations resulted in the immediate sale of a Hinowa Lightlift 23.12 machine, a tracked access platform that offers a maximum working height of 23.2m and a horizontal outreach of up to 11.4m. The forestry sector is leaning more and more towards using powered access for their jobs rather than the more traditional methods of working at height, such as climbing and using ropes and hoists. In the forestry and agricultural sector, fall prevention and health and safety are paramount. Wilson Access are seeing the growing popularity of track mounts in this sector due to their versatility. Jessica Brunyee can be contacted on 0844 288 9338 or email jbrunyee@afi-group.co.uk for any track mount enquiries or hire bookings.